The Jumbo Valley is located in the Central Purcell Mountain range. 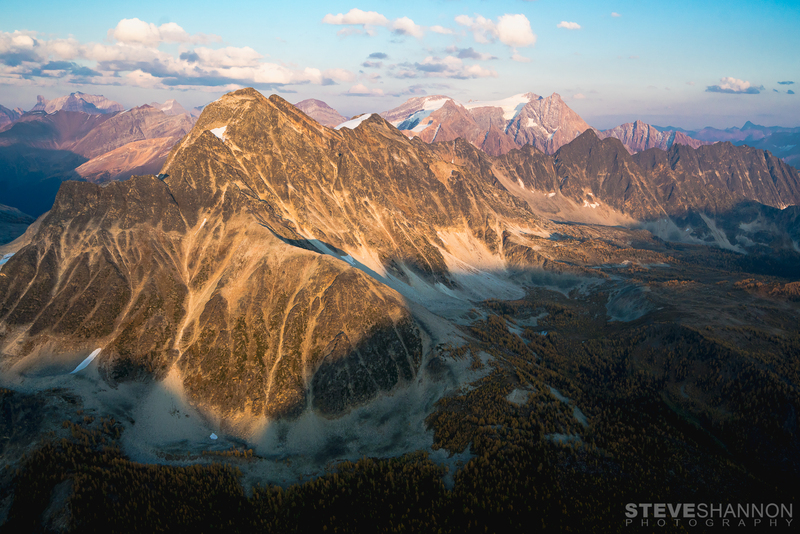 Situated in the southeastern corner of British Columbia, the Purcell mountains form the rugged heart of a dramatic landscape bounded on two sides by the Columbia River. The largest river in the Pacific Northwest, the Columbia starts its 2000 km journey to the sea from its headwaters in the Rocky Mountain Trench. Cutting a swath along the eastern side of the Purcells, the Trench hosts one of the longest stretches of undeveloped wetlands in North America. These productive areas form crucial migratory bird habitat, just as the region as a whole is critical for grizzly bears, mountain caribou, wolverines, badgers and a host of other wildlife. The Purcells, ancient even in geological terms, began rising 170 million years ago, long before the upstart Rocky Mountains. This mountain barrier casts a rain shadow over the East Kootenay, while the moist western slopes are a world apart where huge cedars and hemlocks form a true rainforest. Nowhere else on the planet does a temperate rainforest lie so far from the ocean. First Nations have made their home in this region since the Ice Age glaciers retreated, and are still closely connected to the land. The Purcells also have a strong history of wilderness recreation, photography and grassroots action. In the 1970’s, Wildsight’s John Bergenske, conservationist and adventurer Art Twomey, and renowned alpinist Pat Morrow toured the province with slides and stories gathered from impassioned hikers, hunting outfitters, fisherman and nature lovers on both sides of the Purcells in order to garner support for permanent protection. 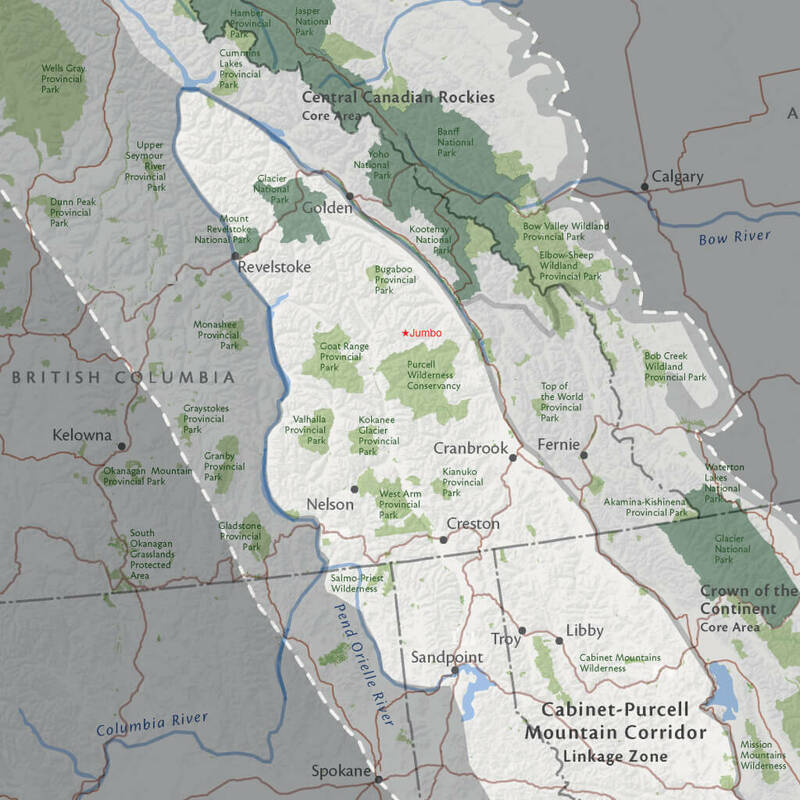 This was instrumental in convincing the BC government to create the Purcell Wilderness Conservancy, a completely unique designation protecting 202,709 hectares. The Jumbo Valley lies just beyond the borders of the Conservancy, just short of protection. Our vision is to work collaboratively to expand protection for the Purcell region, making sure that wildlife can freely and safely roam, water runs clean and clear from the mountains to our communities, and the ecological and cultural integrity of the wild Purcells remains intact for future generations. Header image by Steve Shannon.